Get to your flight in no time and get a little familiar with a new place if you have not been to Albuquerque International Airport previously before in the past. Close to downtown and offering ultimate guest convenience, the highly-rated Albuquerque International Sunport is a popular hotspot not because it offers a gateway into New Mexico’s largest city, but an environment that’s as warm as a southwest sun. With thoughtful services and interesting shops & restaurants, problems will become as rare as rain. ABQ offers a wide variety of parking options, from the four-level garage that offers hourly and daily parking to the much more affordable daily rates at the Economy Lot located on the north side of the garage. The Credit/Debit Lot only accepts Credit cards or Debit Cards, offering the same price as the Economy Lot with a convenient location on the east side of the Parking Garage. Located on Girard Boulevard SE are two Cell Phone Lots that offer free temporary parking, one of which is the Aircraft viewing Area. 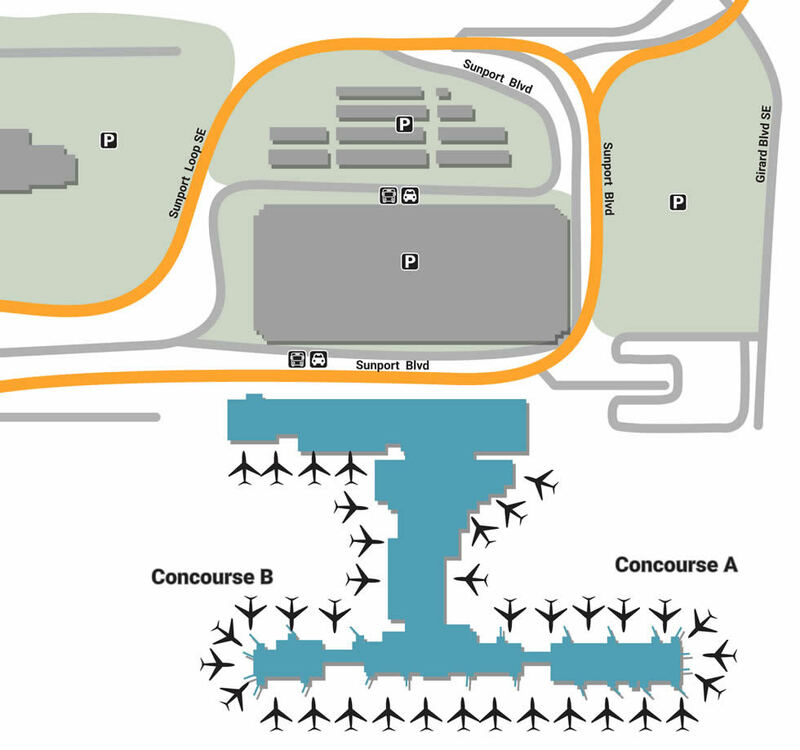 Another Aircraft viewing Area is located on Spirit Dr SE, connecting to the south terminal. If there’s anywhere to hold your pride and ask for help, it’s an airport. Get where you need to go with the advice and knowledge of others, whether it’s the vibrant paintings installed as part of the Sunport Arts Program or the gift of silence in the single Meditation Room. There are also basic necessities available for the disabled including access ramps, braille, and TTY telephones, not to mention Smart Cartes in every terminal. If you find yourself bored to tears, browse the web with the facility’s complimentary Wi-Fi. With a variety of things to do outside the airport, it’s important to keep yourself occupied inside. Make delays fly by at Earth Spirit, a hand-crafted jewelry store located in the A/B Terminal Connector. Explore even more Native American artifacts at Sundance Trading Co., located in the pre-security shopping strip, or enjoy a bright sundress from Concourse B’s Sunport Boutique. If you’re looking for a special something near Concourse A, pick up a regional souvenir at ABQ Style, a gift shop that prides itself on a unique inventory you can’t find anywhere else. Instead of snapping from stress, tame your nerves with a meal from one of the local eateries in each terminal. Whether you’re in a hurry to leave or just arriving for a long trip, Tia Juanita’s (A/B Connector) offers some of the best sopapilla fries in the city. If you’re in the mood for fresh Italian, walk over to La Trattoria next-door, or catch a quick buzz at the nearby Rio Grande Brew Pub. Bask in the glory of Baskin Robbins, located in the Concourse B beside the equally sweet Snack Attack, which offers dried fruits, pretzels, specialty popcorn, and more. For those in need of a fresh lunch or even a brisk cup of coffee in Concourse A, walk over to Black Mesa Coffee & Bakery for gourmet sandwiches, steamy cups of soup, and mocha lattes that make it all worth the wait.